Words can't even describe this classically beautiful master suite! Designed by the talented designer Mark Gillette, this elegant bedroom with a refreshing twist is absolutely swoon-worthy! 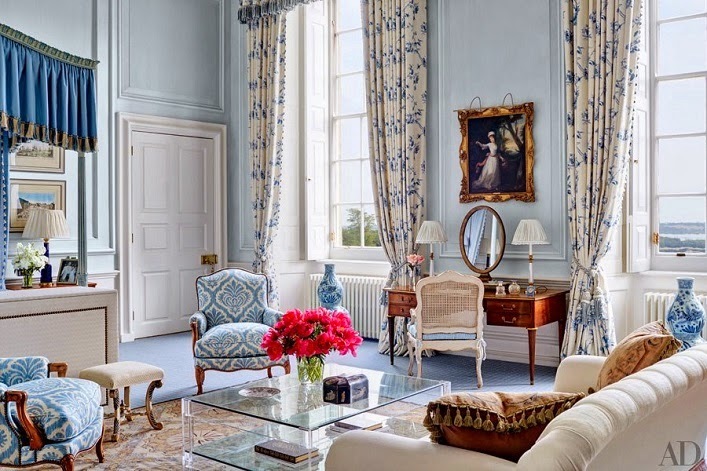 Tall ceilings, spacious and gorgeous details aside, the fabrics, patterns, the blue and white color palette and especially the chic lucite coffee table make this room undeniably memorable! I love, love this dreamy room. What about you? A room fit for a princess!